Please forgive me, because I'm about to go full-on Japanophile for this review. My college Japanese teacher was trained in chanoyu (tea ceremony), and every year, she would demonstrate tea ceremony for the public. The university had an actual tea room that was designed and donated by a successful alumnus. I'm not sure which style of tea ceremony she did, but it was always fascinating to watch her in the tea ceremony mindset. Every motion was full of purpose. Everyone got to try the tea, which was made from the powdered green tea leaves (aka matcha), but my professor always asked one student to be her tea ceremony guest for the demonstration, and one year, it was me. Just being the guest required a bit of study, which made watching her perform the ceremony all the more impressive. All I remember is sitting in formal Japanese style, rotating the bowl before I drank the tea, and finding the bitter matcha to be delicious. 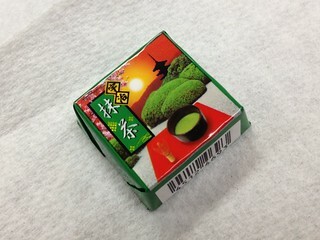 This whole story leads me to this Uji Matcha Tirol because it reminded me of tea ceremony. A sweet such as yokan (jellied bean paste) is usually served with the matcha to compliment the bitterness of the tea, much like this particular Tirol. The deep green chocolate was beautiful, and it smelled like matcha and yokan. 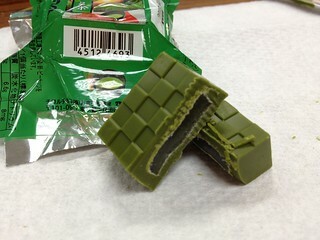 The chocolate wasn't very sweet at all, and the matcha flavor got stronger as it melted and was bitterest at the finish. The jelly center reminded me very much of yokan, though not quite as beany. It was sweet and lightly flavored, and helped to balance the bitterness of the matcha. The texture of the chocolate by itself was a bit sticky and soft, and it reminded me of candy melts rather than white chocolate. That was the only issue I had - the chewy center had a pleasant gummy texture, and it cancelled out the slightly odd texture of the chocolate.